A common shortcoming of standard Monte Carlo Simulation is the required computing resources and time. MC simulation typically has an error variance of σ2/n.To achieve a desired accuracy in a crude MC simulation, the sampling is conducted with a larger value of n. But this approach decreases the efficiency of the simulation. In this post, I will explore few variance reduction techniques in MCS which can greatly improve the accuracy of option price convergence and the standard error. In this post, I will walk you through Simulating Call Option Variance Reduction techniques. where r is the risk-free rate of interest and σ is the volatility of the stock. The control variate estimate is the average of IID copies of, ,where b is the optimal coefficient and K is strike price of a call option with maturity T. The idea behind antithetic variables is to introduce some correlations between the terms of the estimate. In a Monte Carlo simulation, instead of collecting the IID data from X1, X2 …. Xn, we simulate it. If we choose n large as 10K or 100K, the central limit theorem justification for constructing confidence intervals can be applied safely. But we can do a little better with simulations. We can inject negative correlation among the variables X1,X2….Xn, or generate copies that while having the same mean, we can have a smaller variance. The variance estimator becomes smaller than σ2/n. This can result in a smaller confidence interval. The focus here is to get better estimates by reducing the uncertainty in our estimate. Simulating Call Option By Variance Reduction spreadsheet is quite straightforward. There are 3 tabs in the spreadsheet and each one of them have same set of parameters. All the three simulation examples were conducted using 10,000 trials.Notice how standard error reduces substantially to 3.10% when the MCS is adjusted to run using Control Variate method. The computational time was a non-issue for 10,000 trials. It took an additional 47 milliseconds. The mean option price converged closer to the actual value of 8.34. This can be a problem if the simulation is run against million of trials in Excel. 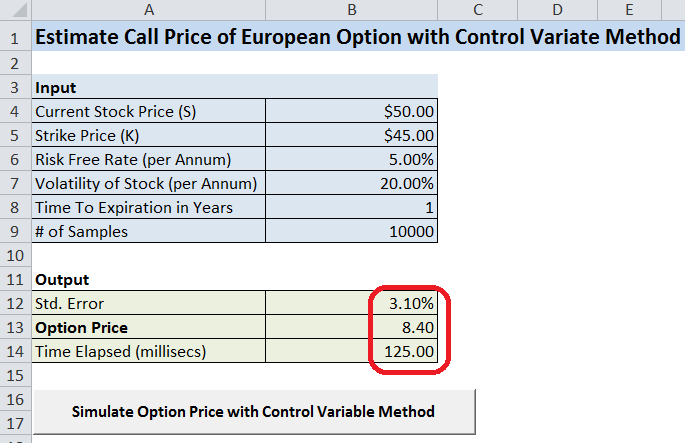 Estimated Call Price by Control Variate Method. 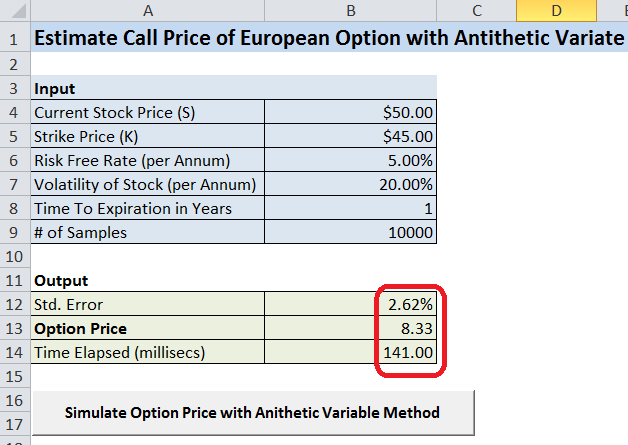 Estimated Call Price by Antithetic Variate Method. The results above show us the relative performance of the three simulation methods in terms of the standard error values and computation times. The same parameters were used for three different methods. All three methods ran with 10,000 trials. In this example, control variate method performed significantly better than Standard MCS. There was mild improvement for antithetic variate method. The only trade-off was more computational time.The performance of the Control Variate estimate is better than the crude Monte Carlo method. As K (strike price) gets smaller, the correlation between the payoff (ST – K) and the stock price ST becomes stronger. The true value of the option at expiry was $8.34 and both the Control and Anithetic Variate methods came close to a penny, outperforming Standard MCS.